June is Megaesophagus month, but all year long a woman in Upstate NY does all she can for dogs with MegaE. Megaesophagus is a condition in which the muscles of the esophagus do not do their job correctly. In a normal esophagus, the muscles push anything that is ingested to the stomach. When a dog has MegaE, the muscles are damaged or did not properly form. They become like a latex balloon that has been blown up and had the air let out of it several times (soggy). Therefore, they create pockets along the esophagus that traps food and water. The muscles aren’t strong enough to push it down to the stomach. Because the food gets stuck in these pockets, it often causes a dog with MegaE to regurgitate nearly every time something is ingested. The regurgitation often leads to Aspiration Pneumonia, which if not caught and treated properly can cause death. Some forms of MegaE can be treated with medication, some by elevating their bowls, some require feeding tubes, and some require special diets. Others utilize a combination of some or all of the above! Those are the words of a pet parent named Kate who loves and lives with three Goldendoodles diagnosed with MegaE. Kate is a young military spouse and a mother of two, who I met through social media. She is a huge inspiration. I initiated contact when I saw a photograph of her doodle sitting patiently in a highchair. Adorable as can be – but I didn’t understand. 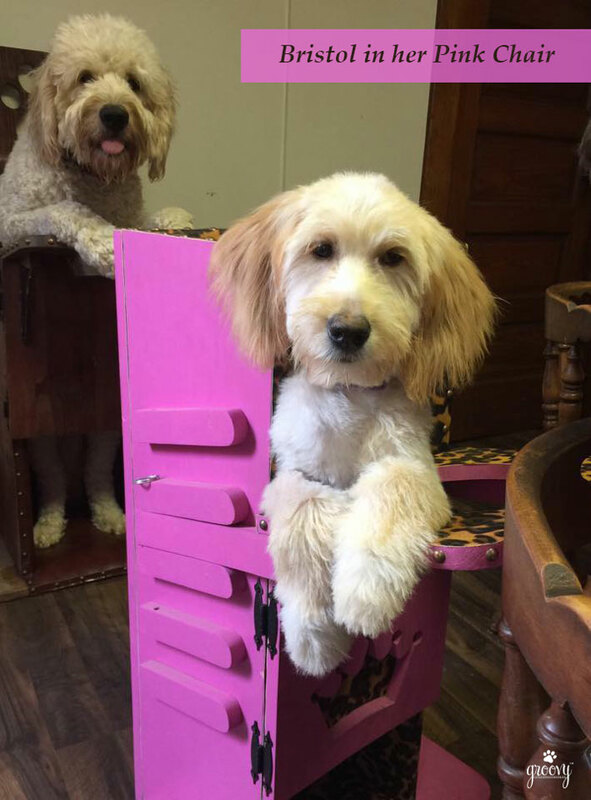 She told me it was a “Bailey Chair” used to feed two of her doodles because they live with MegaE. Kate first heard of the Bailey Chair through an amazing support group who directed her to the creative minds behind this miracle highchair. Willie’s first chair was built by her husband under the guidance of the chairs inventor. We kept in touch, talking “Doodle” and by the beginning of 2014, I’d learned even more about MegaE and Kate’s quest to find ways to raise money for more chairs. I wanted to help. I wanted to help raise awareness, so I wrote a blog post about her. You see, the Bailey Chairs are not cheap to build. It’s actually easier to purchase material and make two at a time. Therefore, all buyers are informed when they place their order that the cost automatically provides another chair to a family in need. The chair literally saved Willie’s life. Kate was so grateful – she was desperate to help others. By spring of 2014 – I wanted to do more. 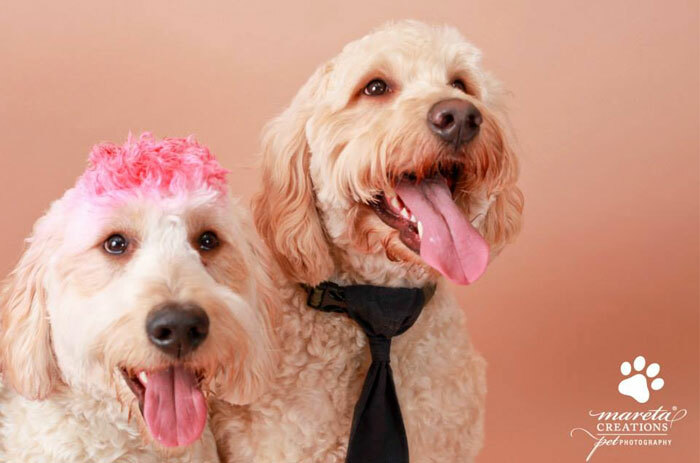 Harley and Leo were in the midst of planning their “Spring-Fling Doodle Romp” at Olde Towne Pet Resort, when the light bulb came on. The unexpected ice and snow storm made it difficult for all who RSVP‘d to come, but it was a great group to be around. Kate brought Willie’s chair and a few items from her Paracord collection. 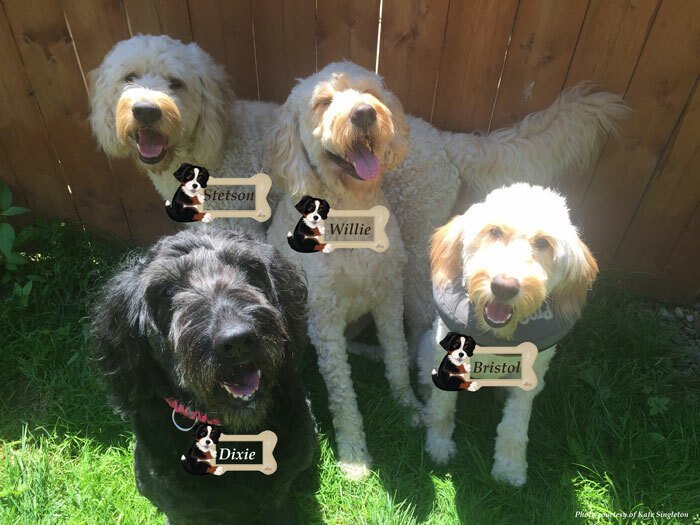 In addition, Kate has assisted in the rescue and placement of six “other” Doodles – ALL of them with MegaE. Be kind to someone and as always, thank you for sharing me with your friends! That is amazing. What a kind a patient person. We are all thankful we don’t have issues such as that, but it good to know there is help out there. Emma, Kate Singleton is a very special angel to many dogs with MegaE. You, your sisters and my boys are blessed with good health! Have a great weekend. Thank you for highlighting mega-e! Zeus was diagnosed in Sept 2013… sadly we lost him earlier this year. I didn’t know either (before) apparently from what I’ve learned – it affects more dogs and cats than we think. I had seen something about this once, but did not know what it was called. How wonderful to see that these dogs can be helped and do so well. It was so great of you to help Kate out with her cause too – what an adorable crew she has! Kate is making a difference – one dog at a time. I am so proud of her efforts and the dogs that come in contact with her are blessed. That is a nasty condition that needs a lot of work. Bless Kate for doing what she is doing! I agree with you – and I second the motion about Kate. She is incredible and her dedication is a rare and beautiful thing to know. That is amazing and awesome Cathy! I’ve actually heard of the Bailey chair and it was probably through you! I didn’t know that dogs with ME could go from the chair to an elevated feeder! I thought they always had to eat in the Bailey chair so thank for explaining that! Jen, neither did I until I started writing this blog post! Willie eats with a little elevation and small meals, but he’s doing so well now. Congrats again on Leroy’s health also – you’ve done a remarkable job! Thanks Monika! It’s a cause that Kate introduced me to – one that has become near and dear to my heart, for all dogs!! !